The quality of Real-Time media (audio, video, and application sharing) over IP is greatly impacted by the quality of end-to-end network connectivity. For optimal Skype for Business Online media quality, it is important for you to make sure there is a high-quality connection between your company network and Skype for Business Online. The best way to accomplish this is to set up your internal network and cloud connectivity based on the capacity of your network to accommodate for peak traffic volume for Skype for Business Online across all connections. Azure ExpressRoute isn't a requirement for Office 365 services including Skype for Business Online. However, Azure ExpressRoute is one of the deployment options that are available that will help make sure that connectivity to Office 365 meets the Skype for Business network performance requirements and ensures the most optimal Skype for Business Online media quality experience. Although this topic provides you with overall networking performance guidance, complete guidance for network assessment is outside of the scope of this document. To find a list of Skype for Business Online partners who can help you with the network performance measurements as part of a thorough and complete network assessment, please visit Skype for Business Partner Solutions. There are many different factors that contribute to Skype for Business Online Real-Time media (audio, video, and application sharing) quality that include the devices that are used, the environment, and the network connectivity. In a Real-Time media session, media capturing and rendering devices that are used by all participants such as headsets and Web cams have a great impact on the overall audio and video quality. Lower quality devices or devices with incorrect device drivers will produce lower overall sound quality for audio and lower image quality for video. Certified devices or good quality devices, on the other hand, help with echo cancellation, noise filtering, video resolution and reduce latency. Although certified audio and video media devices aren't required, it's highly recommended devices certified for Skype for Business for the most optimal media experience. For a list of all Skype for Business certified devices, see Phones and Devices for Skype for Business. You can use the Skype for Business Online Call Quality Dashboard, found in the Skype for Business admin center, to verify devices in use are working correctly and monitor audio and video media quality. A certified device is required for the most optimal Skype for Business media quality experience. It's important to remember that any media devices, Skype for Business clients, and Skype for Business Servers through which Real-Time media flows, introduce some amount of latency. The device and software processing latency, along with network latency, have a great impact on and contribute to the end-to-end overall latency and the end user's experience. The environment and surrounding area where users are meeting and using audio and video devices is another big factor for audio and video quality. Users calling from a noisy environment will have echoed, muffled and unclear audio. Users in a dark or low light environment won't be able to produce bright, clear image quality for video. In a conference room setting, the location of the microphone and video device have a direct impact on the sound and image quality that participants will receive. To get a clearer picture of a user's audio and video experience use the Skype for Business app Tools > Options > Audio Device or Video Device to make changes to the device in use and customize its settings. Latency This is the time it takes to get an IP packet from point A to point B on the network. This network propagation delay is essentially tied to physical distance between the two points and the speed of light, including additional overhead taken by the various routers in between. Latency is measured as one-way or Round-trip Time (RTT). Packet Loss This is often defined as a percentage of packets that are lost in a given window of time. Packet loss directly affects audio quality—from small, individual lost packets having almost no impact, to back-to-back burst losses that cause complete audio cut-out. Inter-packet arrival jitter or simply jitter This is the average change in delay between successive packets. Most modern VoIP software including Skype for Business can adapt to some levels of jitter through buffering. It's only when the jitter exceeds the buffering that a participant will notice the effects of jitter. Buffering for jitter will increase end-to-end latency. With many concurrent Skype for Business Online Real-Time media sessions, as well as other network traffic generated by other Office 365 services and other business applications, making sure that there is sufficient bandwidth over the entire network path that connects your network to the Skype for Business Online service is critical to avoid network congestion and ensure excellent media Real-Time media (audio, video, and application sharing) quality. In addition, traffic congestion across a network will greatly impact media quality. To allow audio and video packets to travel the network quicker and to be prioritized over other network traffic in a congested network, Quality of Service (QoS) can be used to help provide an optimal end-user experience for audio and video communications. QoS provides a way for you to assign higher priorities to network packets that are carrying audio or video data. By assigning a higher priority to these packets, audio and video communications are likely to travel over the network faster, and with less interruption, than network sessions involving things like file transfers, web browsing, or database backups. That's because the network packets used for file transfers or database backups by default are assigned "best effort" as a priority and network congestion won't have as large impact. If you don't assign a higher priority to the media (audio, video, and application sharing) packets and leave them also assigned as "best effort", they too will be processed along with all other network traffic. Depending on the amount of network congestion, this will potentially end up in a lower overall audio and video quality experience for your users. It is highly recommended that you implement QoS on your network to make sure that network congestion within your network won't have an impact. However, for this to have the maximum impact, all networking endpoints must support QoS, meaning that all endpoints must honor QoS marking and packet prioritization. Skype for Business Online services honor QoS marking and prioritization within the Microsoft network. However, traffic that is routed across a public connection like the Internet from your company network to the Microsoft network doesn't preserve QoS markings and packet prioritization. Private connections from your network to Office 365 using Azure ExpressRoute offer a deployment solution that preserves QoS markings and packet prioritization that will in turn increase overall audio and video quality for your end users. Skype for Business Real-Time media travels through many different devices, client apps, server software, and across different networks. The end-to-end latency of Real-Time media is the total amount of latency that is introduced across all components and network segments. The quality of the end-to-end network connection is determined by the network segment with the worst quality. This segment acts as a bottleneck for this network traffic. The following diagram illustrates one-way audio flow in a conference from one Skype for Business participant to another. Connection from User 1 to the edge of the Microsoft network This usually includes a network connection such as WiFi or Ethernet, the WAN connection from User 1 to the Internet egress point (your network Edge device), and the Internet connection from your network Edge to Microsoft network Edge. Connection within Microsoft network This is between the Microsoft Edge to Skype for Business Online data center, where the A/V Conferencing servers are used. Connection within Microsoft Network This is between the Skype for Business Online data center and Microsoft network Edge. Connection from Microsoft network edge to User 2 This includes the Internet connection from your network Edge to Microsoft network Edge, the WAN connection from User 2 to the Internet egress point (your network Edge), and the network connection such as a WiFi or an Ethernet. Connection from a Skype for Business client caller to the edge of the Microsoft Network This usually includes a network connection such as WiFi or Ethernet, the WAN connection from the Skype for Business client caller to the Internet egress point (your network Edge device), and the Internet connection from your network Edge to Microsoft network Edge. Connection within Microsoft network This is between the Microsoft Edge to Skype for Business Online data center, where a Mediation Server is used. Connection between Microsoft Network and the PSTN service provider partners This is the connection that exists to place a PSTN call from the Skype for Business client that is outside of the Microsoft network. For optimal Skype for Business media quality, the following network performance metrics targets or thresholds are required for a connection from your company's network to the Microsoft network Edge. This segment of the network includes your internal network, this includes all WiFi and Ethernet connections, any company site-to-site traffic over a WAN connection, for example Multiprotocol Label Switching (MPLS), as well as the Internet or ExpressRoute partner connections to the Microsoft network Edge. Connectivity between a Skype for Business client on your company network to Office 365 services must meet these following network performance requirements and thresholds. The Microsoft network has over 160 Edge locations worldwide. We work with major Internet Service Providers (ISPs) worldwide through those Edge sites. The latency metric target assumes your company site or sites and the Microsoft Edges are on the same continent. Your company site or sites to the Microsoft network Edge connection include first hop network access, which can be WiFi or another wireless technology. The network performance target assumes proper bandwidth and/or quality of service planning. In other words, This applies directly to Skype for Business Real-Time media traffic when the network connection is under a peak load. The following are the network performance targets or thresholds that are required for the connection between your network Edge and the Microsoft network Edge. This segment of the network excludes the customer's internal network or WAN, and is intended as guidance when testing your network traffic that is sent over the Internet, or through an ExpressRoute partner network and can also be used when negotiating a performance Service Level Agreement (SLA) with your ExpressRoute provider. Connectivity between your company network Edge to the Microsoft network edge must meet these following network performance requirements and thresholds. The performance target requires connection between any of your company's network Edge and its nearest Microsoft network Edge, to be on the same continent. The network performance target assumes proper bandwidth and/or quality of service planning. This also applies to Skype for Business Real-Time media traffic when the network connection is under a peak load. For proper bandwidth and QoS planning, please refer to ExpressRoute and QoS in Skype for Business Online. To measure the actual network performance, especially for latency and packet loss, from any company network site to a network Edge, you can use tools such as ping, test against a set of Skype for Business media relay services running from the Microsoft Edge and data center sites. For testing Internet connections to the Microsoft network, it is recommended that you test against the following VIPs of the Skype for Business media relays. The Anycast VIP will resolve to an IP address of a Media Relay in a Microsoft network Edge site that is closest to the testing location. You should assess your internal network as well as the connections to Office 365. You should assess and gather data for all of your networks over a long period of time. We recommend for you to perform your testing of network performance for a minimum of a week, so that you can see usage patterns for all business days and hours. This will show you peak times. You should take multiple samples of network performance measurements. We recommend taking a measurement every 10 minutes from a company site during the entire period of time you are gathering data. For comparing the Skype for Business Online network performance requirements, take the 90th percentile measurement value from this sample data set. You should continuously assess the network's performance. Network utilization varies over time due to usage pattern changes, new enterprise-based applications that use a large amount of bandwidth, and changes to your organizational or physical company locations. It is important for you to continuously monitor your network performance against these network performance requirements and targets/thresholds and make timely adjustments to ensure the most optimal Real-Time media quality. Instead of testing against the Microsoft network Edge sites, there are network assessment solutions from Skype for Business customers and partners that leverage testing setup for services in the Microsoft Azure cloud. In those solutions, the network assessment tools test latency, packet loss and jitter against custom endpoints set up as a service in the Azure cloud. As a result, the test network traffic travels through one additional network segment, which is the connection within the Microsoft network between the network edges and Azure data centers that hosts the network assessment service. For those network assessment solutions based on Azure hosted testing services. We recommend performing the network assessment within country and/or region. For example, for customer sites in east U.S., the assessment should be performed against a testing service instance hosted in Azure's east US data center region. Below are the latency (RTT) targets for the Azure service based network assessment setup. The one-way latency targets will be half of the corresponding RTT targets. The packet loss and jitter goals stays the same as those defined for Skype Media Relay based testing. Azure ExpressRoute for Office 365 is a dedicated network connection for connecting to Office 365. It offers customers the ability to have control over the path their Office 365 network traffic takes. They no longer have to be concerned with the unpredictable routing that happens on the Internet where data is carried by unknown carriers, providers and ISPs. Network traffic that is sent through ExpressRoute is sent directly across the ExpressRoute partner's network to Microsoft's network. This allows customers to treat Office 365 as if it is located in their own off-site data center with a dedicated connection. Azure ExpressRoute is available for all Office 365 licensing offerings. However, the Azure ExpressRoute Premium Add-on is required for Office 365 to enable global routing. Office 365 customers with at least 500 seats who are implementing ExpressRoute can get the required ExpressRoute Premium Add-on at no additional expense. Is ExpressRoute required for good media quality? Azure ExpressRoute isn't a requirement for getting the most optimal Skype for Business Online media quality. It is, however, one of the deployment options that help you make sure that your cloud connectivity meets the Skype for Business network performance targets or thresholds. Office 365 is a high performance and secure service that uses the Internet. We continue to invest in new security capabilities and regional Edge nodes to continuously improve security and performance. Azure ExpressRoute isn't a requirement for Office 365 services including Skype for Business Online. Azure ExpressRoute is one of the deployment options that are available that will help make sure that connectivity to Office 365 meets the Skype for Business network performance requirements and ensures the most optimal Skype for Business Online media quality experience. For Skype for Business Online media quality, it is important that the connection between your company sites and the Microsoft network Edges meets the performance targets in Network Performance requirements from a Skype for Business client to Microsoft network Edge and that the connection between your network Edges and the Microsoft network edges meets the performance targets in Network performance requirements from your network Edge to Microsoft network Edge. It is also important that your company's physical network connectivity, including your internal network and cloud connectivity capacity accommodate peak media traffic volume. Azure ExpressRoute is one of many ways that will help customers ensure their Skype for Business Online cloud connectivity meets all of these performance requirements. Is ExpressRoute required for voice quality SLA? Calls from Microsoft certified IP Phones. Voice quality issues due to Microsoft Network problems. The voice quality SLA excludes those calls where the low call quality is caused by problems in non-Microsoft networks including ExpressRoute partner and other networks. Before making a decision on network connectivity options to Skype for Business Online, customers must assess their network and current Internet connectivity based on the network performance requirements described in Network performance requirements to connect to Skype for Business Online. If network performance over the current Internet connection is set up for enough capacity during peak time and that it meets the network performance requirements from sites to Microsoft network Edges and from your network Edges to Microsoft network Edges, you can continue to use your existing Internet connectivity to connect to Skype for Business Online. For company sites where network performance requirements aren't being met, we strongly recommend that you first work with your existing network service providers to improve your overall network performance. However, if they aren't still being met, using Azure ExpressRoute can help ensure your Skype for Business Online cloud connectivity can help you meet the network performance requirements. A service level agreement (SLA) on availability of the connection between your network and Microsoft network. ExpressRoute has a guaranteed Availability SLA of 99.9%. Planned and guaranteed bandwidth required for Office 365 services. You can achieve this by sending only Office 365 traffic or Skype for Business traffic using the ExpressRoute and then have all other Internet traffic go through other Internet egress/ingress points for your network. ExpressRoute is designed to preserve DSCP QoS markings between your network and the Microsoft Network. For more information about ExpressRoute QoS and capacity planning, please refer to ExpressRoute and QoS in Skype for Business Online. Can I setup Azure ExpressRoute for Skype for Business Online Only? Yes, you can set up Azure ExpressRoute to ensure excellent network connectivity from your company's network to only Skype for Business Online. This will provide the most optimal Real-Time media quality for your users but you can then continue connecting to other Office 365 services over the Internet. The Border Gateway Protocol (BGP) is a routing protocol on the Internet that is used to route network traffic across the Internet. It is designed to exchange routing information between autonomous systems (AS) found across the Internet. BGP communities values are attribute tags that can be applied to incoming or outgoing routes. BGP communities are often used to signal to the receiving AS which outbound link to use to reach a given destination based on geography, service type or other criteria. With BGP communities support, Microsoft will tag prefixes and routes with appropriate BGP community values based on the service they belong to. Microsoft will tag prefixes advertised through public peering and Microsoft peering with appropriate BGP community values indicating the region the prefixes are hosted in. You can rely on the community values to make appropriate routing decisions to offer optimal routing. You can use the Skype for Business Online BGP community value to setup up an ExpressRoute connection only for Skype for Business Online. You can find out more at ExpressRoute routing requirements. If you have decided that ExpressRoute based on recommendations above is for you, here are the recommendations on where and how many ExpressRoute connections you should get. 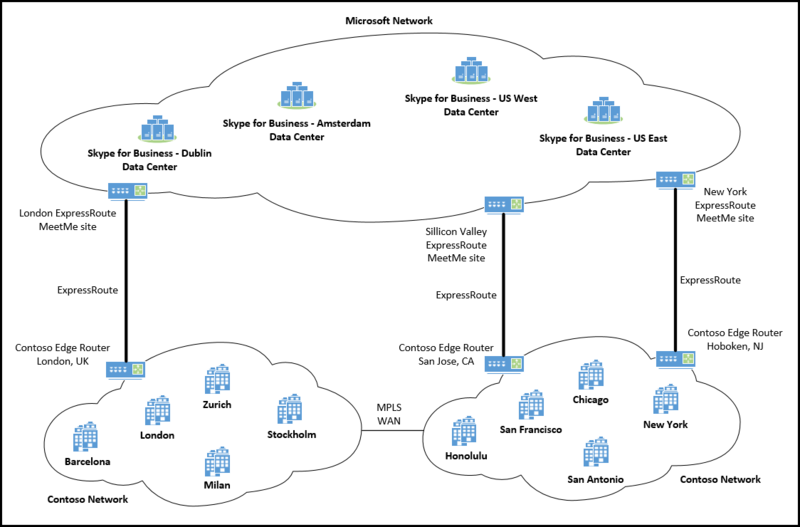 If all of your users use the Skype for Business Online service, and if your offices are centered around a single physical location and you decide to deploy Azure ExpressRoute, you should set up single ExpressRoute connection between your company site to the closest ExpressRoute peering location. The following graphic shows an example of this type of deployment. For this example, Contoso is a university located in Orlando, FL. Contoso has 10,000 faculty members and students. The Internet tests from their location to Microsoft edge sites showed greater than 5% packet loss during peak class hours. The have decided to get a dedicated connection to Office 365 using ExpressRoute with over-provisioned bandwidth so they can avoid the network congestion for Office 365 especially for Skype for Business Online Real-Time traffic. 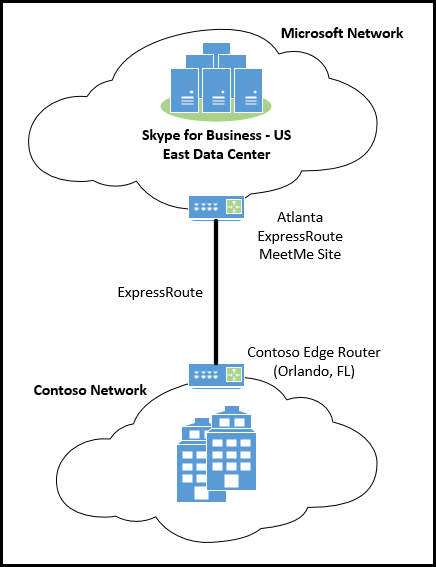 They connect to the Microsoft cloud through ExpressRoute at the Atlanta, GA MeetMe site. 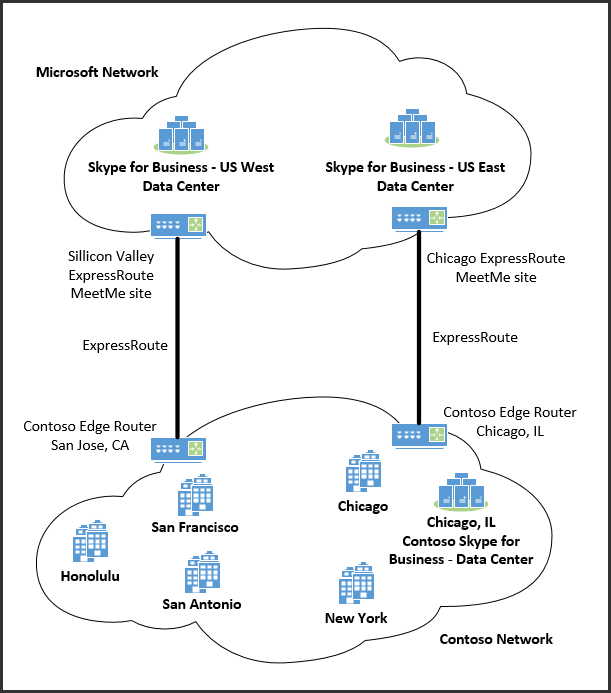 If your company is using Skype for Business Online services from multiple offices in the same region or continent, and you chose to implement Azure ExpressRoute, it is recommended to connect your main site via ExpressRoute, and then optionally add additional ExpressRoute peering for other locations that do not meet the recommended network performance targets. In the following example, Contoso is an US travel services company that is headquartered in New York but has other offices across the United States. Their offices are inter-connected through an WAN that uses MPLS for connecting to Office 365. They initially set up an ExpressRoute connection from their Internet router in Hoboken, New Jersey to the New York MeetMe site. With this setup, network traffic from most of their sites to the Microsoft Network (New York Edge site) can meet the Skype for Business client connection network performance targets described in Network Performance requirements from a Skype for Business client to Microsoft network Edge. However, latency between Contoso's west coast offices to New York is going over 50ms one-way. In addition, Honolulu is the second largest office for Contoso, latency from Honolulu to New York exceeds 80ms one-way. To ensure good media quality for users in those offices, Contoso decided to add a west coast ExpressRoute connection between their San Jose site and the Silicon Valley ExpressRoute MeetMe site. 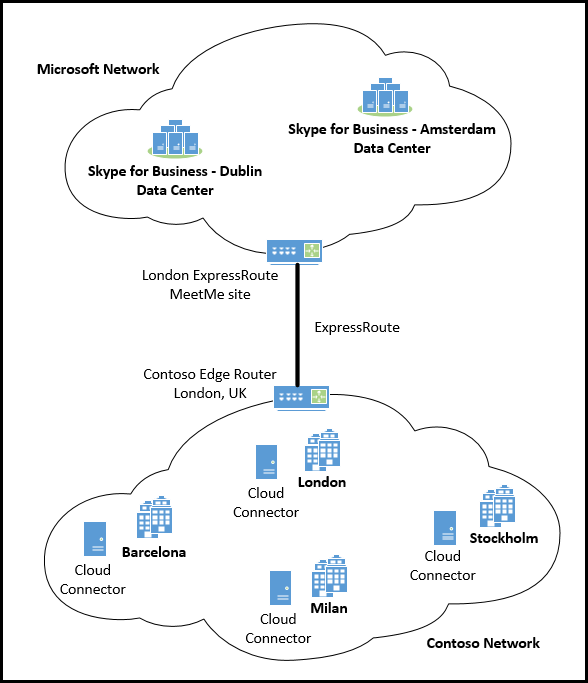 If all of your users are using Skype for Business Online service, and if your offices are in multiple physical locations across multiple continents, if you decide to deploy Azure ExpressRoute, you should set up at least one ExpressRoute connection for each continent between each continent's main site to its closest ExpressRoute peering location. Depending on cost vs benefit, you can choose to deploy additional ExpressRoute connections from sites where network performance targets aren't met. In the following example, Contoso is a large corporate law firm with offices in major cities across North America and Europe. Based on their Internet connection and their internal network performance assessment, Contoso decided to deploy two ExpressRoute connections in North America and a single ExpressRoute circuit for all their European offices. 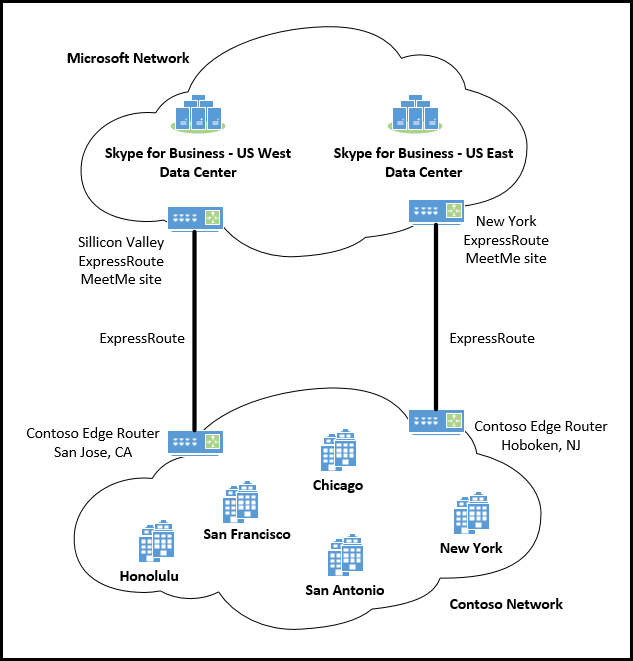 If you have an on-premises Lync or Skype for Business deployment and choose to implement a hybrid Skype for Business Online integration, we recommend that if you decide to deploy Azure ExpressRoute, you need to have at least one ExpressRoute connection for each on-premises Lync or Skype for Business Edge site and at least one ExpressRoute connection for each continent with offices. Depending on cost vs benefit, for each continent you can choose to deploy additional ExpressRoute connections from offices where network performance targets aren't being met. If you have an on-premises Skype for Business deployment, you must follow the Edge Server Planning and Deployment Guide. Specifically, the Edge servers must be reachable from outside of your network. This is usually achieved either by assigning a routable public IP address to the Edge server, or by using network address translation (NAT). In the following example, Contoso has an existing on-premises Skype for Business Enterprise Voice deployment. They want to migrate on-premises users to Office 365 online services. They also decided to use a hybrid deployment so that they can continue to use their existing PSTN infrastructure for all on-premises and online users. Contoso's on-premises data center and Skype for Business Edge Servers are in Chicago. For their deployment, Contoso decided to set up one ExpressRoute connection between their Chicago data center and the Chicago ExpressRoute. They also added a west coast ExpressRoute connection to better serve their Honolulu office. Skype for Business Online Cloud Connector Edition is a hybrid offering that consists of a set of packaged Virtual Machines (VMs) that implement on-premises PSTN connectivity. By deploying a minimal Skype for Business Server topology in a virtualized environment, you will be able to send and receive calls with landlines and mobile phones through the existing on-premises PSTN voice infrastructure. If you decide to deploy Azure ExpressRoute and Cloud Connector Edition, we recommend for you to set up at least one Express Route connection for each continent between each continent's main site to it's closest ExpressRoute peering location. Depending on cost vs benefit, for each continent you can choose to deploy additional ExpressRoute connections from sites where network performance targets aren't being met. If you have an on-premises Skype for Business deployment, you must follow the Planning Guide for Skype for Business Cloud Connector Edition. Specifically, the Access Edge and A/V Edge services should be assigned public IP addresses and reachable from Office 365 data centers. In the following example, Contoso is a European accounting firm with presence in a few major European countries and cities. When they sign up for Skype for Business Online for all their collaboration needs, they decided to put a Cloud Connector for each country they have a physical location to continue to use their PSTN infrastructure and carrier contracts that already exist. 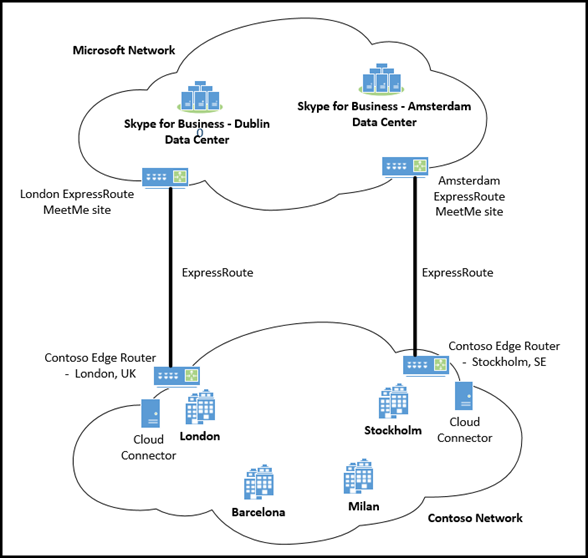 Based on their testing from all their sites and Microsoft network Edge, they determined that a single ExpressRoute connection in London will help meet the Skype for Business client connection network performance targets described in Network Performance requirements from a Skype for Business client to Microsoft network Edge. Below is another deployment option for Contoso. In this case, they decided to set up an ExpressRoute connection at each site where a Cloud Connector is deployed.